I assumed all my major worries would all centre around Corey’s food allergies. The flight was actually very pleasant and exciting for us. Oddly enough, food allergy WAS NOT the reason that we almost cancelled our trip. But we’ll get to that in my next post. For now, we were off to a great start beginning with the flight up. 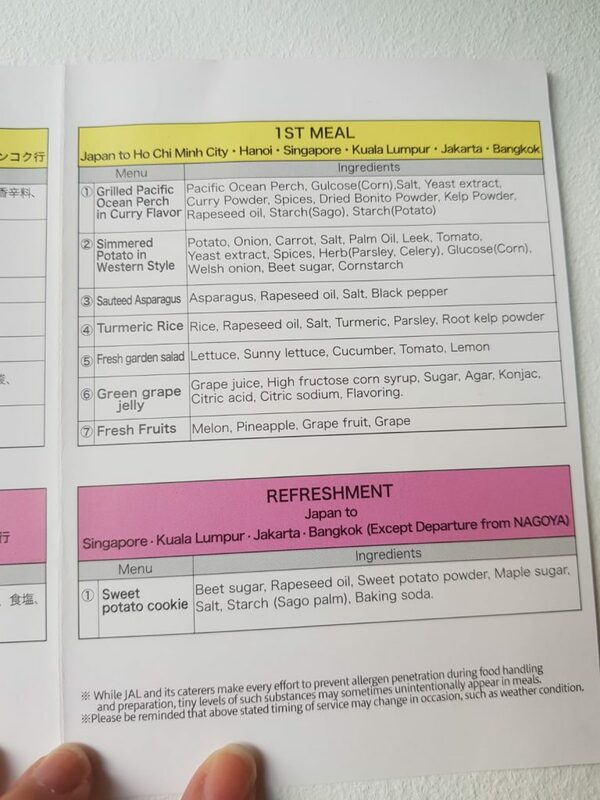 As I previously posted on “Planning Travels with a food allergic child: The Airline” we chose to fly Japan Airlines specifically for their minimum allergen meals. A minimum allergen 7 meal is void of Japan’s top 7 allergens namely: Shrimp, crab, wheat, buckwheat, dairy products, eggs and peanuts. A minimum allergen 27 meal is void of a whooping 27 allergens. 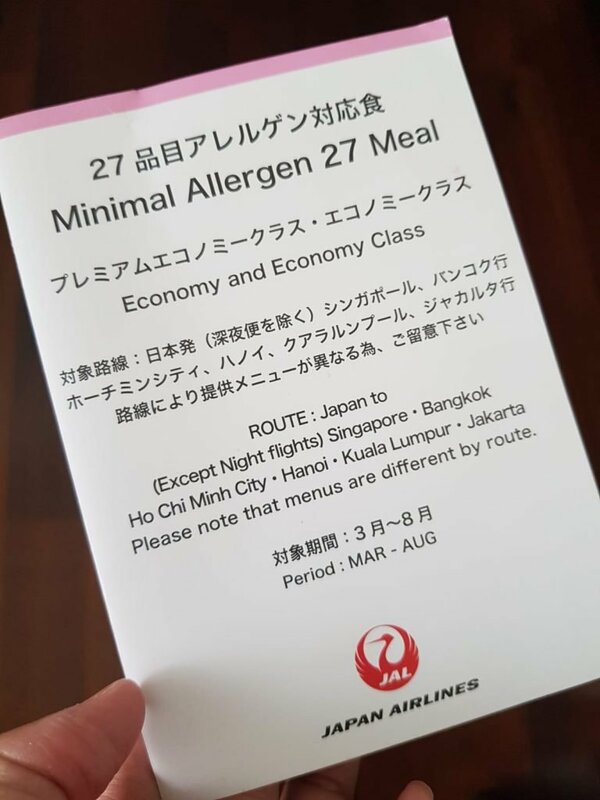 Japan Airlines has taken the extra step to produce a meal that does not contain the top 7 plus an additional recommended 20 allergens. The 20 additional allergens are abalone, cuttlefish, salmon roe, oranges, kiwis, beef, walnuts, salmon, mackerel, soybeans, poultry, bananas, pork, matsutake mushrooms, peaches, yams, apples, gelatin, cashews and sesame. We chose the minimum 27 allergen meal for Corey to be extra conservative. He enjoyed his meal and I enjoyed not worrying about him reacting to anything in the meal. Refer to this link for more details on their minimum allergen meal options. I was too excited on our flight up to take photos of the menu card given to us. Thankfully, I managed to keep the one given for his flight back which I’m sharing below. Corey’s allergy needs were addressed at every step. Corey was not able to do an online check-in like the rest of the family. He had to be checked-in at the counter so his flight requirements could be rechecked. I appreciated the extra cleaning conducted. And the upfront honesty that they “cannot prevent other passengers to carry on peanuts”. 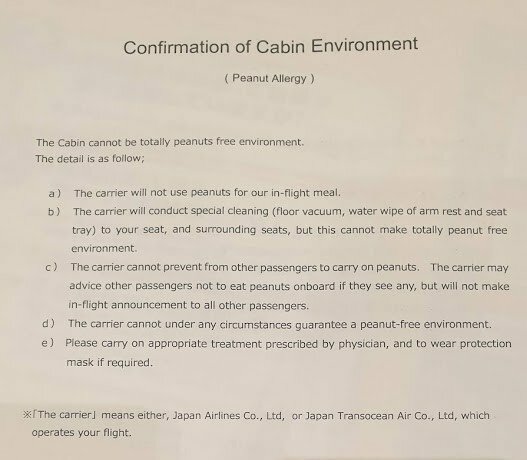 The peanut allergy disclaimer also clearly states the steps the airline will take in advising “other passengers not to eat peanuts onboard if they see any”. Allergens mandated by Japanese law and recommended to declare are catered to Japanese culture. The minimum allergen meals contain fish and pork. Food-allergic persons who do not consume pork for religious or other reasons may find this a roadblock. Nonetheless, the number of allergens removed in their meals is still impressive. In contrast, other airlines can do take a page from Japan Airline’s example. 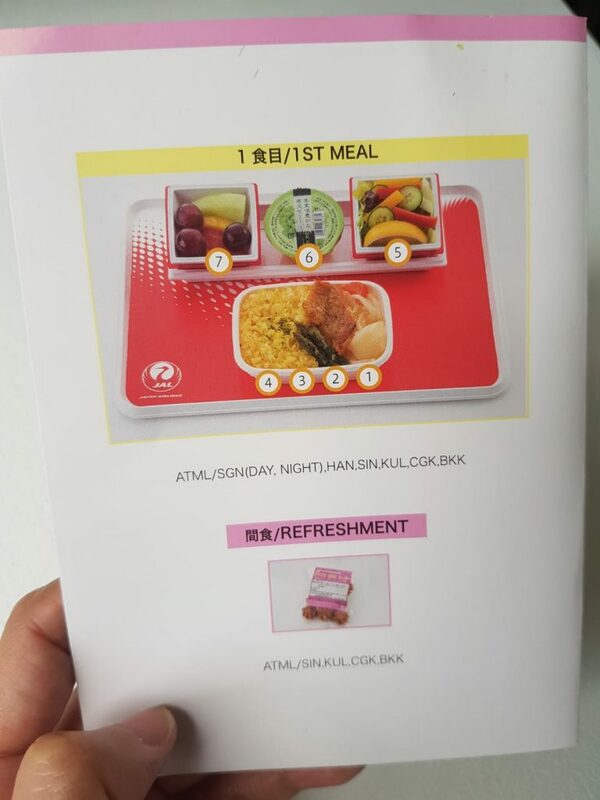 Without a doubt, Japan Airline’s minimum allergen meal met Corey’s food allergy needs perfectly. It can be stressful flying with young children, no less allergic ones. The fact that our flight was uneventful was a winner in my books. 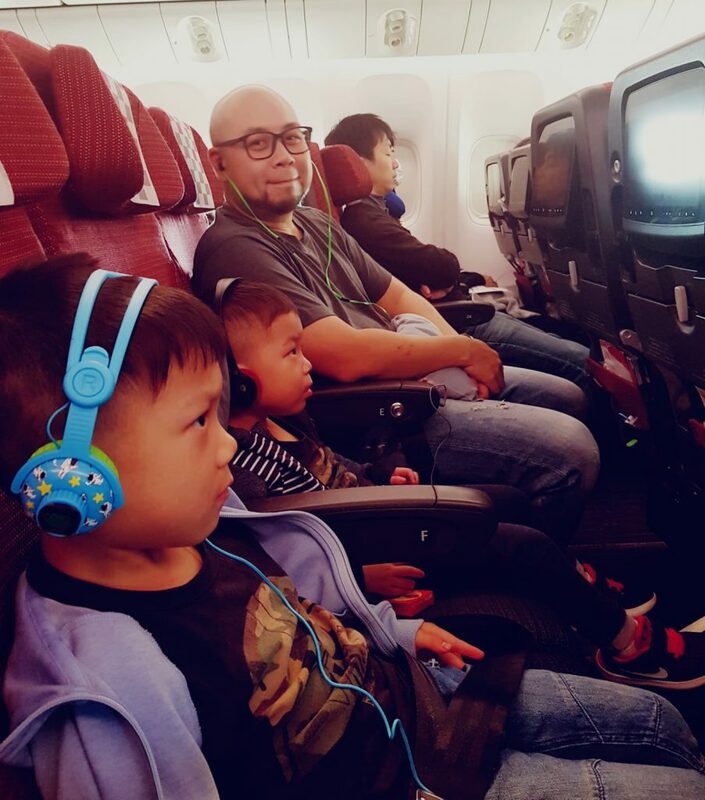 The kids ate, watched cartoons, played games on the inflight entertainment system. No reactions, no fussiness and importantly, no allergic reactions of any sort from Corey. 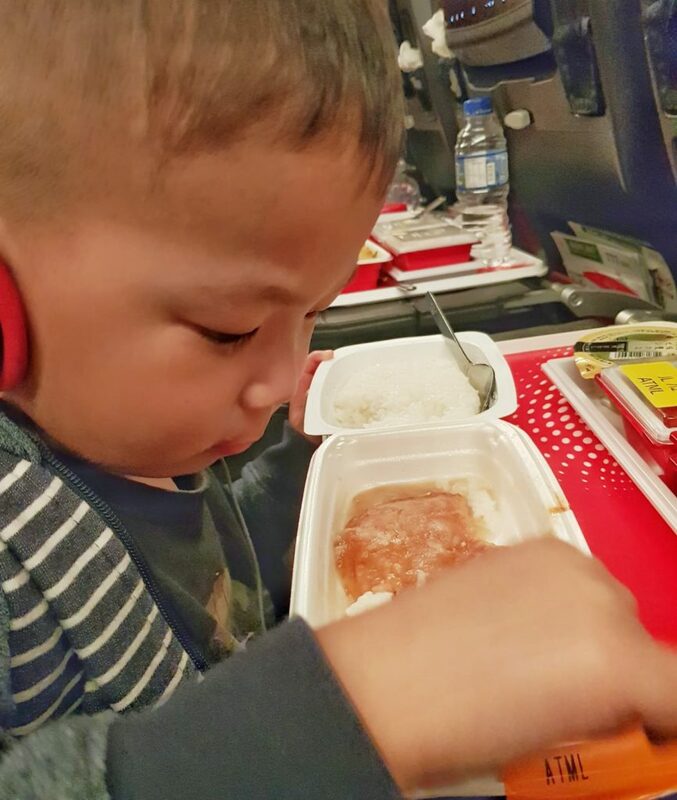 To others, it would seem like a small thing to eat an inflight meal. Notably, for Corey who is allergic to eggs, dairy and peanuts, this milestone is one I will forever remember. Thank you Japan Airlines for making our flights a breeze. Share and like this post and help others who might find it useful! Connect with me by liking our Facebook Page @projectsimplicitysg or follow me on Instagram @amandaprosimple.